Finally, I noticed that SSMS uses a surprising amount of CPU during the loop (about half a core on average). 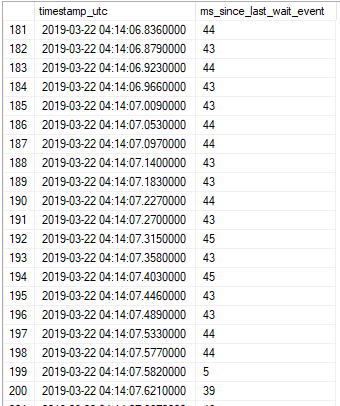 I'm unable to figure out what SSMS is doing during that time. Why does a simple loop cause ASYNC_NETWORK_IOwaits when executed through SSMS? The only output that I appear to get from the client from this query execution is the "Commands completed successfully." message. You are not running the statements in a stored procedure, so SQL Server sends DONE tokens (code 0xFD) to indicate the completion status of each SQL statement. These messages are deferred, and sent asynchronously when the network packet is full. When the client does not consume network packets quickly enough, eventually the buffers fill up, and the operation becomes blocking for SQL Server, generating the ASYNC_NETWORK_IO waits. A DONE token is returned for each SQL statement in the SQL batch except variable declarations. For execution of SQL statements within stored procedures, DONEPROC and DONEINPROC tokens are used in place of DONE tokens. You could also use sys.sp_executesql to achieve the same result. Ultimately, the number of ASYNC_NETWORK_IO waits depends on the client and driver, and what it does, if anything, with all the DONE messages. 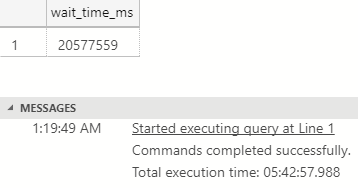 Testing with a loop 1/10th of the size given in the question (5,000,000 loop iterations) I found SSMS ran for about 4 seconds with 200-300 ms of waits. sqlcmd ran for 2-3 seconds with single digit ms waits; osql around the same run time with around 10 ms of waits. Why is there ASYNC_NETWORK_IO wait type on Shared Memory connections? Why do async_network_io wait types occur? Does dm_exec_procedure_stats.total_worker_time include signal waits? Why does a plan with FULL optimization show simple parameterization?